A black, ready-mixed, high temperature silicate cement. This black furnace cement can be used for resetting furnaces, stokers, oil burners. Also works for sealing air and gas leaks, imperfections and breaks in all types of stoves, ranges and furnaces. Can be used for sealing flue, coal or ash pit doors and for resealing gaskets in stove doors. 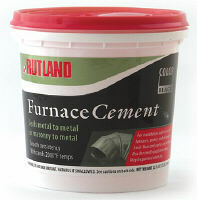 This furnace cement by Rutland has the appearance and texture of fine mortar, and will withstand temperatures to 2000°F. When air dried and cured according to directions, this cement becomes as hard and durable as firebrick.